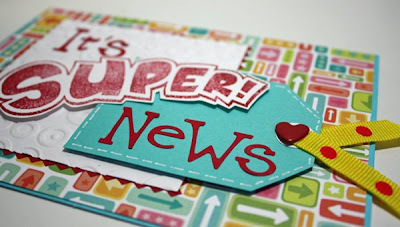 My friend Katie received from "Super News" the other day....she applied for a position within our local school board system and, after a few days, the Principal called to offer her the job!! 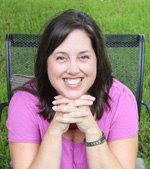 We are all so excited for her...she applied along with 82 other applicants!! Jobs within the school board system are in such heavy demand right now. I knew she was coming over for a little visit yesterday, so I had a goodie bag and card ready to help her celebrate the exciting news. The goodie bag included some yummy chocolates. I love this patterned paper from K&Co. 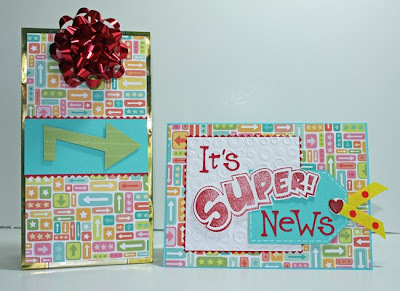 The small alphabet die cuts are from the Sizzix Wingo Zingo strip die and the "Super" stamped sentiment is from Michael's. I also used my Spots & Dots Cuttlebug embossing folder, my white gel pen and ribbon from my stash. We are all so happy that she won't have to move to another school and I am happy that I can co-share Room Mom responsibilities with her.